A one-volume history of mounted warfare is a bold undertaking, for the scope of the topic is immense. 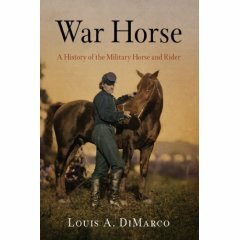 As Louis DiMarco remarks in the introduction to this new study, “the war horse and rider was a viable military system for more than 3,000 years, far longer than any other military system” (ix). It is a challenge that has largely defeated the handful of historians who have attempted the task thus far: G. T. Denison, in the late nineteenth century, wrote what was, essentially, a polemic advocating the then current “mounted rifleman” school rather than a history;1 in 1961, James Lunt, a former cavalryman, published an elegy for his arm, too episodic to serve as a general history.2 In the 1970s, two works, one a collection of essays,3 the other a monograph by John Ellis,4 attempted a more comprehensive coverage, but these slim volumes provide only superficial treatment of their topic, and Ellis’s work is marred by his ideological prejudices against those social classes who (in the west at least) traditionally dominated the cavalry branch. DiMarco’s work is different: in his history, the horse itself provides the strong, central, unifying theme. The physical characteristics of the horse, breeds and types, horse equipment, equitation and horse mastership (care of horses) in the field—these are DiMarco’s concerns as he takes his reader from the earliest years of man’s blossoming relationship with equids, up through their use by American special forces in Afghanistan today. I can recommend DiMarco’s work as the best single-volume history of cavalry…. War Horse by Michael Morpurgo is a novel of the horse at war, told in the first person from the perspective of the horse. Orginally published in 1982, the book has been republished as the theatrical version has become a major hit on the London stage. Though it is written for children and young adults, it is a moving and emotional story that will appeal to adults as well –especially those who have a special affinity for horses. It is a short book that can be read in an evening, but still conveys a full and satisfying story. Though the book takes place in the midst of World War I, its central theme is that the best of man can be evoked, even in difficult circumstances, by the simple goodness found in horses. Morpurgo does an outstanding job drawing you into the world as seen by Joey, the part thoroughbred English farm horse who finds himself in the British cavalry in 1914. For the next four years Joey experiences all the roles of the war horse: cavalry mount, ambulance team, and artillery horse. He also meets and befriends people and horses on all sides of the war: Germans, British, and French. One of the secrets of War Horse, I believe, is that Joey is a believable horse. Morpurgo gives Joey just enough awareness and voice to allow him to tell his story, but not so much that he becomes a cartoon of the horse. Though the author gives voice to Joey’s thoughts, those thoughts are mostly about what is important to a horse: food, the weather, water, other horses, fear, excitement, and did I say food? Morpurgo captures the fact that Joey is aware of humans and their world, and can distinguish and values the difference between different people. Thus, the horse knows who is kind, who cares, and who does not –and responds to that treatment. Michael Morpurgo is one of Great Britain’s top Children’s book authors. He has written over 100 books aimed at young readers. He is not a military historian but he relied on detailed interviews with World War I veterans to bring authenticity to Joey’s story. The major military themes in the book are accurate: the difficulty of cavalry attacking wire, the role of artillery teams, the functioning of the veterinary service, and the fate of horses at the end of the war. Morpurgo also demonstrates a solid understanding of horse care, training, and breeds. I was particularly impressed with his mention of the Hanovarians and Haflingers in the German artillery service. War Horse is an enjoyable and touching afternoon’s read, expertly written for the adult and child. It conveys the essential goodness of animals and horses in particular, and demonstrates how they bring out the best in men even in the middle of the horror of war. Like all good war fiction, War Horse is essentially an anti-war story. It reminds me again of my own conclusion after writing my non-fiction work on war horses: the best thing man has ever done for horses is develop technology to the point that the horse no longer has to participate in war. War horse was the runner up for the best Children’s book award in Great Britain, the Whitbread Award, and has been turned into a hugely successful play in the London theater. It is scheduled to begin playing in New York in 2011. I highly recommend the book and the play –though the latter is only by reputation. The above quick clip is the trailer for the play. The below clip describes the horse puppeteering required to make the play work. Its technically fascinating and definately a show I would travel to see! Bullets and Bolos: Fifteen Years in the Philippine Islands Fighting Insurgents with the Philippine Constabulary. John R. White. St. Petersburg, FL: Hailer Publishing, 2007 (originally published New York: Century Company, 1928), 348 pages, $29.99. Bullets and Bolos is the story of one American’s experience during fifteen years (1901-1916) as an officer of the Philippine Constabulary. John White’s narrative is a fast paced, interesting and insightful read about how a former American soldier adapts to the challenge of leading foreign indigenous troops in combat. It almost reads like a novel, but is full of intelligent insights and wisdom regarding an important and complex aspect of counterinsurgency. John White’s story begins when he joins the Philippine Constabulary after his service with the U.S. volunteers during the Spanish American War. As that war evolves into the Philippine Insurrection, the army mustered the volunteers out. White elected to muster out in the Philippines and seek service with the growing U.S. civil service. He first worked as a civilian clerk for the army commissary, but then enlisted as an inspector in the new Philippine indigenous police force –the constabulary. White describes the highlights of his next fifteen years service commanding Filipino constables as they track and fight insurgents, bandits, and Muslim warriors through swamps, jungle, mountains, and even at sea. White quickly proved himself to be an exceptionally effective leader, and a string of promotions and more challenging assignments took him to the rank of constabulary colonel and district supervisor. Moroland, 1899-1906. America’s First Attempt to Transform an Islamic Society, by Robert A. Fulton (Bend, OR: Tumalo Creek Press, 2007), 417. 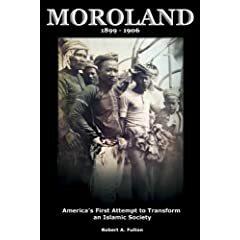 Moroland by Robert A. Fulton is a comprehensive examination of American policy toward and military operations against the Moros of the southern Philippine Islands from 1899 to 1906. Fulton very effectively covers policies, politics, and military operations. What emerges from his work is a fascinating tale of brilliance and opportunities lost. It is a must read volume for anyone interested in a host of contemporary issues including counterinsurgency, clash of cultures, Islamic warrior societies, and nation-building. The Philippine War, 1899-1902, by Brian McAllister Linn (Lawrence: University Press of Kansas, 2000), 427. Brian Linn’s The Philippine War is the best history of the U.S. war in the Philippines from February 1899 to July 1902. Linn’s work systematically covers all aspects of the war, all the major personalities, and makes a special effort to address the major myths and misconceptions regarding the war. Linn’s history is simply the best, clear, and objectively reasoned discussion of the military aspects of the war yet written. One of the great values of Linn’s work is his efforts to provide balance and accuracy to the many misconceptions and myths that have been created or perpetuated by earlier histories of the war. Thus, though conceding that Generals Otis and MacArthur were quirky personalities who made some serious mistakes, he also recognizes that each of the first two American commanders were essentially competent and in different areas, very capable. Otis, the trained lawyer, laid the foundation of the President McKinley’s benevolence policy, while MacArthur recognized the need for and supervised the well run counterinsurgency campaign of 1901. Linn backs up John Gate’s analysis that the major part of the insurgency was won by the time MacArthur gave up command in the Summer of 1901 and makes the point that the Samar and Batangas campaigns, the most infamous of the war, were not typical of the war in general. Another blogger has favorably mentioned War Horse as well as a couple of other new and interesting military equestrian titles. See the “Ride to Victory” blog by clicking here. Benevolent Assimilation: The American Conquest of the Philippines, 1899-1903,Stuart Creighton Miller, Yale University Press, 1982. Benevolent Assimilation is one of the most referenced and consulted works on the American – Philippine war. The book is a well-written general military and political history that falls into the group of new-left histories written during or shortly after the U.S. Vietnam war. As such, it consciously evaluates the American experience in the Philippines within the context of the perceived American tragedy of Vietnam. Miller’s view is that American success in the Philippines represents the triumph of a world military power over the nationalistic aspirations of an oppressed indigenous population. Miller’s is an important work to read and understand. To many, the book continues to represent how the U.S. military repeatied mistakes made in earlier wars in Vietnam. Currently, it is also used to illustrate the flawed U.S. policy in Iraq. For these reasons it is important that military professionals engage with Miller’s history, and are able to compare and contrast his history with the more nuanced, pragmatic, and realistic analysis of John Gates and Brian Linn. Normandy to Victory : The War Diary of General Courtney H. Hodges and the First U.S. Army, by Major William C. Sylvan and Captain Francis G. Smith Jr. (edited by John Greenwood), is an important book on U.S. Army operations in the European Theater during World War II. Its greatest contribution is as resource for understanding many of the important operations of the war from the perspective of General Hodges and his headquarters. It is also valuable as a firsthand account of leading soldiers in battle at the field army level. This book is not for the uninitiated. Truly appreciating the detail, nuance, and its value as a primary source, requires grounding in the history of the U.S. Army in Europe during World War II. That said, for those with a serious interest in World War II history Normandy to Victory is a “must have” book. Schoolbooks and Krags: The United States Army in the Philippines, 1898-1902. John M. Gates. Westport, CT: Greenwood Press, 1973. Gates is at his best discussing the American strategy. He effectively describes how the two aspects of the dual strategy of attraction and chastisement complimented each other. The book begins with the efforts of General Otis, the first commander, who did not have the military strength to accomplish his mission, vague guidance from the President, and few intelligence sources. Otis did not understand the strategy of the Philippine revolutionaries led by Emilio Aguinaldo. None-the-less, the American army quickly defeated the Filipinos in the conventional phase of combat in 1899. Gates then details how General Arthur MacArthur wrestled with the challenge of devising and executing a strategy aimed at defeating the Filipinos who had reverted to a deliberate stratagem of guerrilla warfare. MacArthur aimed at separating the insurgents from the civil population and then defeating them. This strategy required close cooperation with William Howard Taft, the U.S. civil administrator in the islands, and pro-American Filipinos. The book concludes with an analysis of how the entire strategy was almost undone by MacArthur’s replacement, General Adna Chaffee, as the Army, according to Gates, over-reacted to the Balangiga massacre. This reaction included the brutal Samar pacification campaign under General Jacob H. Smith.